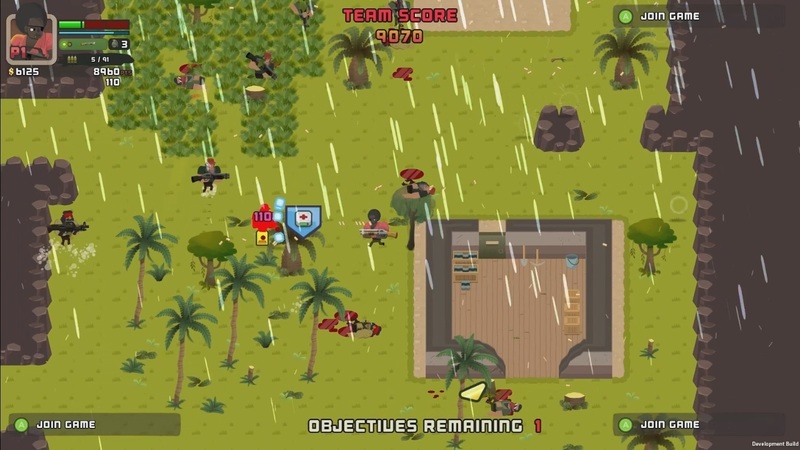 Tango Fiesta is a top down co-operative shooter created for 1 to 4 players. You and up to three friends can join forces and dive right into the action in this gripping and delightfully droll homage to classic 80’s action films and characters. Spilt Milk Studios have created a splendid mix of classic action and humour within a top down shooter that offers hours of entertainment to yourself and up to three friends as you slash, shoot and explode your way through different levels with increasing numbers of bad guys that just need to take a beating before you complete the in level objectives. First impressions are the most important when it comes to games, and especially with indie games and I have to say that Tango Fiesta is one of those indie titles that while awesome sounding in the description seems to just miss the mark a little in terms of first impressions. 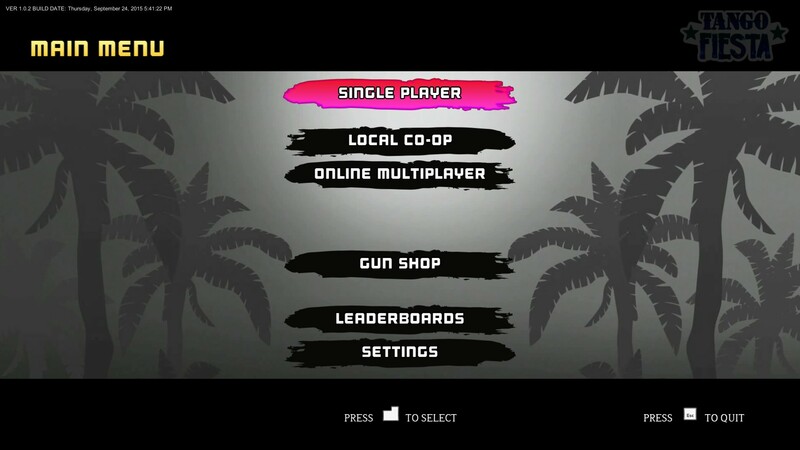 Now don’t get me wrong, it introduces itself as exactly what it is, a co-operative top down shooter game designed to entertain yourself and your friends, and it goes further to ingratiate itself with tonnes of references and nods to 80’s action films in both terms of game play and the achievements list, as well as with the soundtrack and character voicing (including voice work performed by The Sound Architect) , but at the same time, it just feels a little lack lustre, as if it is missing that little something special that sets it apart from the rest of the indie pile. The biggest impression that I got about the game is that it is effectively a glorified flash game, that while designed for Steam, could also very much sit as a browser game for players to hit up every now and then just to kill some time. When it came to the single player experience, I already figured that since it was paying homage to 80’s action it wouldn’t have much of a plot, I found excitement at first when I started out with Bionic Cop, but that excitement soon wore off and was replaced with a slight modicum of tediousness as the game progressed and I found myself just repeating the same actions I carried out on Mission One, shoot the dudes, complete the objective, roll on to the next. That said, while I found the action within the Single Player section to be tedious, the difficulty does increase as the game progresses, which is nice because it eases the player into the game and the increase in difficulty over time negates the “throwing them in the deep end and seeing how they get on” which can happen a lot in games, and that can soon put players off playing. And I will admit that while I found the missions a little tedious after a while, there is some amusement in there for you action game fans that just want to blow things up and shoot as many opposing forces as possible before completing the mission. I have given the online multiplayer a brief whirl with a buddy that wanted to give the game a go and we just found it awkward to work with. There was lag over the connection and I experienced part of the “story” intro to the mission stuck over my screen for the first mission, meaning I died within minutes as my character ran around blindly in circles. There were also frame rate issues on my friend’s side of the connection, meaning he found it difficult to play the game, so after the brief dalliance, we left the multiplayer alone. It is worth noting however, that what I experienced with my friend is by no means set in stone for the experience of others, and from what I can deduce, there is a certain amount of popularity for the multiplayer section as it allows friends to play together if they live a distance apart and then on top of that you can be teamed up with up to three random people to take on the missions of the game which awesome as it can really diversify the ways the missions are completed depending on how each player prefers to play this type of game. This also means that there is an element of replay-ability to the game that is missing from the single player side. 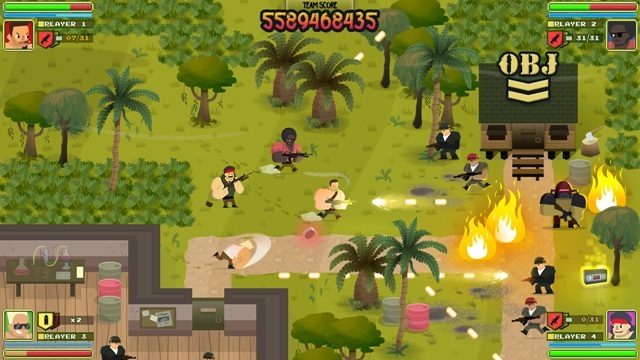 With an increase in the number of enemies to take care of due to the number of players, the missions aren’t going to be a simple walk through to complete objectives, there is some thought in the challenge, which should bring teams a happy amount of time working through the game together, blasting all before them with their rifles in pursuit of more ways to commit wholesale digital slaughter. I found within the character selection that the characters are well balanced against one another so that if there is a single player they can just choose the one that best suits their style of playing this type of game, while within team games, the players can each pick not only the character that compliments their individual play style, but that also compliments the style of the overall team, showing that there is some diversity within play tactics that teams and utilize to find the most fun/efficient way to complete the game. The controls were excellent. 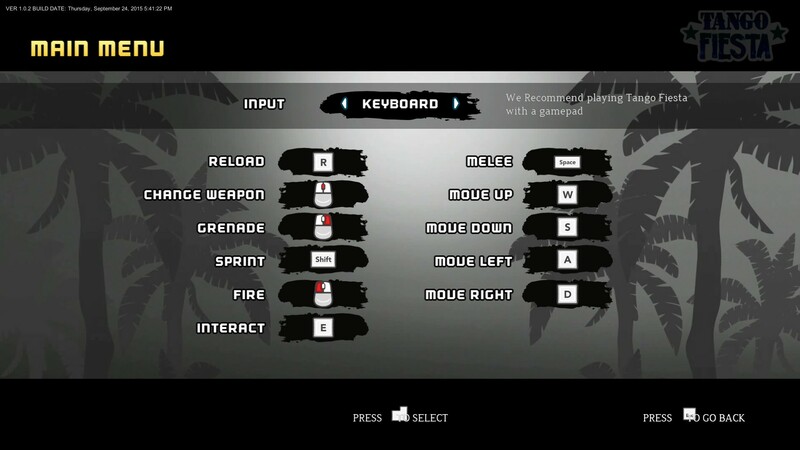 There is the option to use either a keyboard and mouse, or a game pad. I used a keyboard and mouse when playing the game and I liked the controls for the most part. It was a standard control layout, moving with the WASD keys and using the mouse to aim, shoot and throw grenades. The other buttons needed were in easy reach on the keyboard too, so there was no need to optimize the layout before playing. Overall the game is rather enjoyable, it works as a means of killing time if you have some spare, and as another option for you and your friends to take out some bad guys and have fun doing so. I think that if they expand on the character roster and introduce some more weapons into their store, along with some different game modes, then it could rapidly increase in popularity and entertainment value.